Store admins can force users to login/register before viewing the store contents. All anonymous users must be denied from viewing the web store. 2. 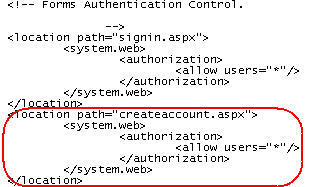 Change allow users="*" to deny users="?". By changing this, we're denying any anonymous user access to the site except the signin.aspx page. Access to this page is given in the beginning of the web.config under the forms authentication control.